THE FOLLOWING BUSINESS TERMS AND CONDITIONS GOVERN A CUSTOMER’S PURCHASE OF FROG HAULING, LLC’S (“FROG HAULING”) SALE TRANSACTIONS AND ARE SUBJECT TO CHANGE WITHOUT PRIOR NOTICE. READING FROG HAULING’S BUSINESS TERMS AND CONDITIONS, WEBSITE, AND / OR ANY LITERATURE CONSTITUTES A CUSTOMER’S FULL AND UNCONDITIONAL AGREEMENT TO ALL OF THE FOLLOWING BUSINESS TERMS AND CONDITIONS. IT IS IMPORTANT FOR A CUSTOMER TO CAREFULLY READ ALL OF FROG HAULING’S BUSINESS TERMS AND CONDITIONS AND TO FULLY UNDERSTAND A CUSTOMER’S’ RIGHTS AND RESPONSIBILITIES. THESE BUSINESS TERMS AND CONDITIONS ARE BETWEEN FROG HAULING AND A CUSTOMER AND GOVERN A CUSTOMER’S PURCHASE OF DUMPSTER RENTAL AND HAULING SERVICES FROM FROG HAULING. FROG HAULING PERMITS A CUSTOMER ACCESS TO LOAD FROG HAULING’S SHIPPING CONTAINER (DUMPSTER) WITH A CUSTOMER’S TANGIBLE PERSONAL PROPERTY, MATERIALS, ITEMS, JUNK AND / OR DEBRIS AFTER FROG HAULING HAS TEMPORARILY PLACED ITS SHIPPING CONTAINER (DUMPSTER) AT A CUSTOMER’S LOCATION. Due to the freezing temparatures in and around Columbus, Ohio there may be residual material at the bottom of a delivered dumpster. This is an industry standard due to the materials dumpsters are made out of and freezing cold temparatures. The amount of material will be miniscule if at all. This is NOT a cause for a refund or discount. Frog Hauling will treat each issue on a case by case basis. Thank you. 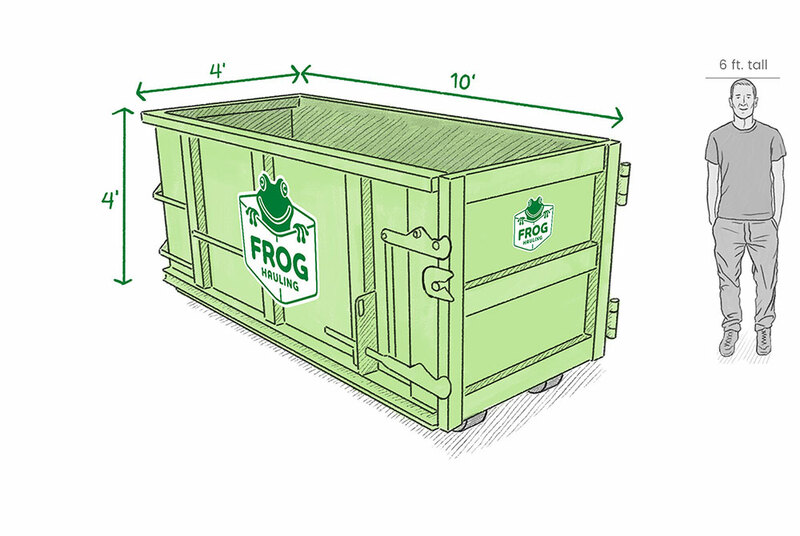 Regardless of how a customer may have discovered Frog Hauling, the results of an Internet word search, whatever may be published on social media or a blog by a third party, and / or a third party’s arbitrary classification of Frog Hauling for marketing or advertising purposes, Frog Hauling is not a dumpster rental company – Frog Hauling is a dumpster rental and its affiliate, which also operates under the Frog Hauling name, Frog Hauling Transportation, LLC., a highway transportation for hire company licensed to operate in the State of Ohio to transport Frog Hauling's dumpsters and the contents placed therein, including a customer’s tangible personal property, materials, items, junk and / or debris from a customer’s requested location. Frog Hauling permits a customer to load Frog Hauling’s shipping container (dumpster) with a customer’s tangible personal property, materials, items, junk, and / or debris at a customer’s location and then Frog Hauling, through it's affiliate- will subsequently transport a customer’s tangible personal property, materials, items, junk and / or debris from a customer’s location to a customer’s designated location for a pre-agreed fee plus any applicable surcharges. A customer always retains full, complete, and unconditional title, ownership, and responsibility for all tangible personal property, materials, items, junk, and debris (also commonly known as contents, freight, cargo, load, and shipment) placed into Frog Hauling’s shipping container (dumpster) by a customer or a third party for shipment to a customer’s designated point of delivery (FOB Destination). At no time does Frog Hauling assume title, ownership, and responsibility for any tangible personal property, materials, items, junk, and / or debris (also commonly known as contents, freight, cargo, load, and shipment) placed into Frog Hauling’s shipping container (dumpster) by a customer or a third party for shipment to a customer’s designated point of delivery (FOB Destination). 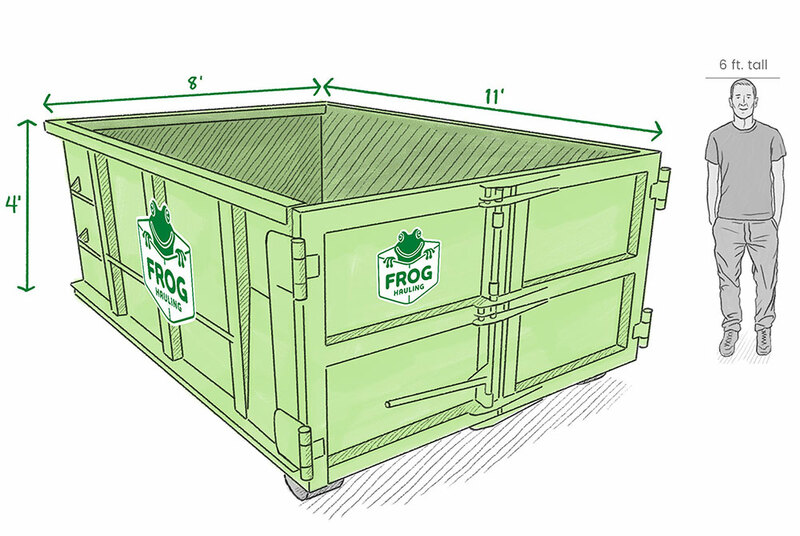 Frog Hauling agrees to transport a customer’s tangible personal property, materials, items, junk, and / or debris placed into Frog Hauling’s shipping container (dumpster) by a customer to an agreed-to and approved destination. Tangible personal property, materials, items, junk, and / or debris are defined to include all non-hazardous materials and permitted objects placed into Frog Hauling’s shipping container (dumpster) by a customer and / or a third party when a shipping container (dumpster) is located on a customer’s premises. Tangible personal property, materials, items, junk, and / or debris are defined to exclude all hazardous materials and non-permitted objects placed into Frog Hauling’s shipping container (dumpster) by a customer and / or a third party when a shipping container is located on a customer’s premises. Frog Hauling will not knowingly transport hazardous materials and non-permitted objects such as but not limited to: radioactive, volatile, flammable, explosive, toxic, liquid, corrosive, asbestos, and medical waste objects, animal carcasses, batteries, appliances, propane tanks, hazardous materials listed by the United States Environmental Protection Agency, and heavy materials such as dirt, rock, concrete, plaster, tile, shingles, and certain types of landscape materials without specific prior approval from Frog Hauling. Customer acknowledges, agrees, and authorizes Frog Hauling to transport a customer’s tangible personal property, materials, items, junk and / or debris from a customer’s location to one of the below locations as determined and selected by a customer. Customer warrants and agrees to provide Frog Hauling with unobstructed access for delivery and pick-up of a Frog Hauling shipping container (dumpster) to a customer to load a customer’s tangible personal property, materials, items, junk, and / or debris and such permitted access is sufficient to bear the total weight of Frog Hauling’s shipping container (dumpster) and Frog Hauling Transportation, LLC. truck before and after a customer’s loading of a customer’s tangible personal property, materials, items, junk and / or debris. Customer additionally warrants and agrees that a customer is unconditionally responsible for any and all damage and / or rust stains that may result from Frog Hauling’s shipping container (dumpster) and Frog Hauling Transportation, LLC. truck and / or shipping container (dumpster) to any driveway, pavement, subsurface, curbing, landscape, grass, or another surface. Although Frog Hauling is not liable for any damage and / or rust stains to any driveway, pavement, subsurface, curbing, landscape, grass, or other surface that may result from Frog Hauling’s shipping container (dumpster) and Frog Hauling Transportation, LLC. truck, Frog Hauling will indemnify, defend, and hold a customer harmless from and against any liability, loss, bodily injury, property damage, and / or violation of any law incurred as a result of Frog Hauling’s gross negligence or willful misconduct during the process of delivery or pick-up of Frog Hauling’s shipping container (dumpster) at a customer’s location. IN NO EVENT WILL FROG HAULING BE LIABLE TO A CUSTOMER FOR ANY INDIRECT, INCIDENTAL, SPECIAL, CONSEQUENTIAL, OR PUNITIVE DAMAGES ARISING OUT OF OR FROM PROVIDING DUMPSTER RENTAL AND HAULING SERVICES AS DESCRIBED HEREIN. Customer agrees to pay Frog Hauling a fee for dumpster rental and a pre-determined transportation fee based on the FOB destination (not origin), volume, weight, and distance of transporting a customer’s tangible personal property, materials, items, junk, and / or debris from one location to another location. 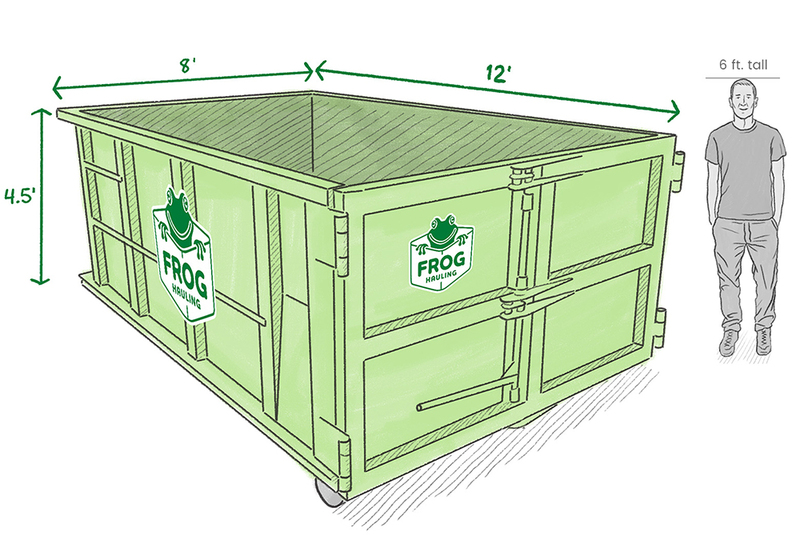 Customer payment is due and payable to Frog Hauling either prior to or at the time of delivery of Frog Hauling’s shipping container (dumpster) to a customer’s location and such payment will be made to Frog Hauling using a customer’s credit card or debit card. If a customer’s order is not accepted or is canceled by Frog Hauling, Frog Hauling will refund the full amount of any payment collected from a customer. All customer sale transactions are subject to applicable federal, state, and local taxes and will also be paid by a customer. If a customer’s location is obstructed for any reason and Frog Hauling cannot place or pick-up Frog Hauling’s shipping container (dumpster), a customer will be charged an additional $100.00 obstruction fee for each incident. If a customer cancels a dumpster rental and hauling service order with less than a 24-hour advance notice before a scheduled placement or pick-up of Frog Hauling’s shipping container (dumpster), a customer will be charged a $100.00 cancellation fee for each incident. 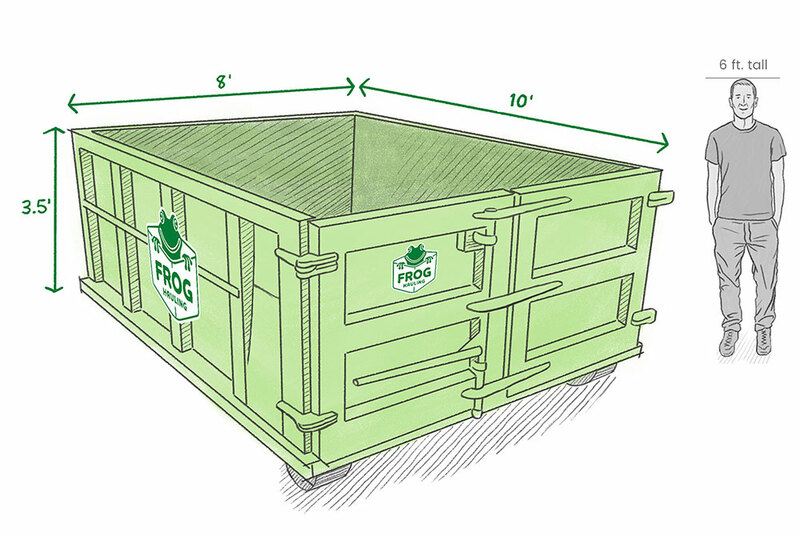 If a customer damages Frog Hauling’s shipping container (dumpster), including the exterior surface paint and the walls, floor, door, and any moving parts of the shipping container (dumpster), a customer will be charged for all costs of repairs incurred by Frog Hauling for each incident. A CUSTOMER IS NEVER PERMITTED TO MOVE FROG HAULING’S SHIPPING CONTAINER (DUMPSTER) WITHOUT FROG HAULING’S PRIOR APPROVAL. If a customer moves Frog Hauling’s shipping container (dumpster) without Frog Hauling’s prior approval, a customer will be charged a $250.00 moving fee and all costs incurred by Frog Hauling to repair and / or retrieve Frog Hauling’s shipping container (dumpster) for each incident. A customer and / or a third party is not permitted to load more than 2.5 tons of a customer’s or a third party’s tangible personal property, materials, items, junk, and / or debris into Frog Hauling’s shipping container (dumpster). If a customer or a third party loads excess weight into Frog Hauling’s shipping container (dumpster), a customer must remove any excess weight, will be charged a $100.00 per ton or any portion thereof overweight fee, AND will be charged a $7.00 (plus applicable tax) per day or portion thereof demurrage fee for each incident. $2.00 Daily Rental Fee Includes Pick Up and Delivery Day. Client Needs to Call For Pickup. If a customer and / or third party loads any prohibited tangible personal property, materials, items, junk, and / or debris into Frog Hauling’s shipping container (dumpster), a customer will charged a $250.00 prohibited fee, the full cost for all cleanup and related charges incurred by Frog Hauling, AND a $7.00 per day (plus applicable sales tax) or portion thereof demurrage fee for each incident. 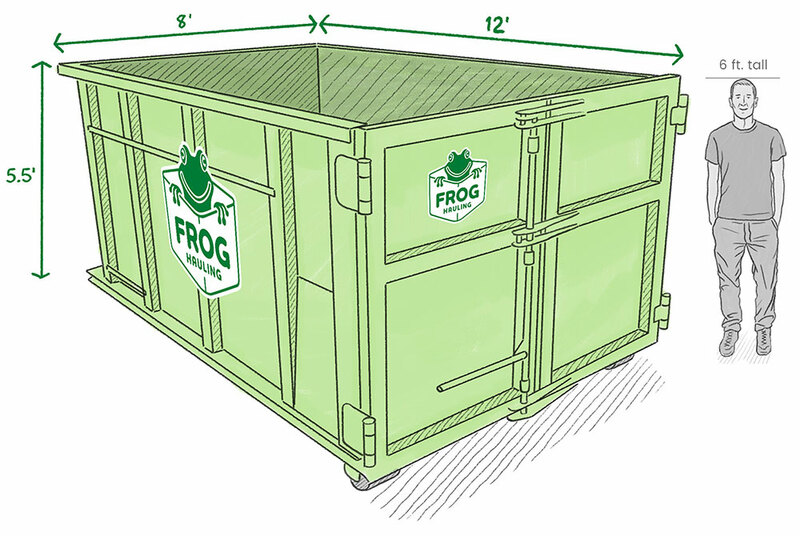 If a customer and / or a third party loads tangible personal property, materials, items, junk, and / or debris above the top of the sidewalls of Frog Hauling’s shipping container (dumpster), Frog Hauling will not pick-up Frog Hauling’s shipping container (dumpster) and a customer will be charged a $100.00 missed pick-up fee, a $7.00 per day or portion thereof demurrage fee (plus applicable sales tax), AND a customer must remove any excess height of a customer’s tangible personal property, materials, items, junk, and / or debris, AND a customer will be charge a $7.00 (plus applicable sales tax) per day or portion thereof demurrage fee in for each incident. Best number to contact you? All orders must be confirmed with a credit card over the phone.